By Annette “Dr Z” Zaharoff, M.D. 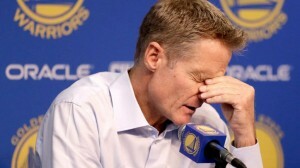 Golden State Warriors head coach Steve Kerr is living in nearly constant pain. By his own admission, he believes he should have avoided back surgery two years ago and stuck to a physical rehabilitation plan to help him deal with now chronic back pain that may force him to retire from a game he loves. The former San Antonio Spurs star’s back problems started after the Warriors won the NBA championship in 2015. He opted for surgery to repair a ruptured disk in his back. After the surgery, he started dealing with leaking cerebrospinal fluid (CSF), the clear liquid that cushions the brain and spinal cord. Kerr went through a second back surgery to stop the CSF leaks, but it apparently did not work. To be clear, I have neither examined Steve Kerr nor have I been consulted about his particular medical crisis. As a sports medicine physician with a practice that focuses on non-surgical options for treating joint pain and soft tissue injuries, I have treated many patients with serious back pain. It’s a growing problem, evidenced by the fact that low back pain is the single leading cause of disability in the world, according to the American Academy of Physical Medicine and Rehabilitation (AAPMR). The kind of pain resulting from CSF leaks can be best described as excruciating. It can lead to crippling headaches, dizziness, changes in vision, ringing in the ears and nausea. And while these leaks may happen spontaneously, they also may result from a nick during back surgery. 1. Progressive weakness because of nerve damage. The damage is so severe that patients can no longer even lift their ankle. 2. Losing control of urine and bowel function. Spinal injury can lead to a condition called neurogenic bladder, which can result in incontinence. 3. Intractable pain: The back pain is severe, constant, debilitating and unresponsive to non-surgical care. In most cases, however, patients who go through a good, evidence-based, effective physical rehabilitation program will not need surgery. Before you go into surgery, you should consider non-operative care. You need to give your body a chance and some time to heal without surgery. For example, a patient with a herniated disk may have pain on the right or left low back. If the disk is pinching a nerve, they may have numbness in the leg, maybe weakness with pain radiating down the calf or foot. Sitting, bending, coughing or sneezing could worsen the pain. I may prescribe anti-inflammatories or recommend cortisone injections. This way, the patient can start managing the pain before they even begin active physical therapy. Therapy may include spinal traction, a form of decompression therapy to relieve pressure on the spine. At the same time, we are re-train the patients movement patterns and postures to prevent further aggravation of the herniated disk. We teach good body mechanics and posture, everything from avoiding “text neck” (a common problem due to increasing addiction to tablets and smart phones) to learning proper lifting techniques. A bad back may seem to pop up because of some obvious injury, but often it’s likely the result of decades of bad habits. Sitting in soft chairs with no support, weeding in the back yard from a stooped over posture, twisting and bending to put away your groceries and living a sedentary lifestyle can add up. And one day, you literally bend over to tie your shoes and BAM; it’s the straw that breaks the camel’s back, pardon the pun. Physical therapy along with medications and injections support the patient to continue in an active exercise program. But the medications won’t cure the problem. They help reduce swelling and pressure from the herniated disk so the patient can keep getting stronger and learn how to protect their back. In the long-term, exercise and good body mechanics will help the patient recover from chronic back pain. Pelvic tilts and stabilization exercises like the dying bug (sometimes called the dead bug) strengthen the core. Stretching to keep the hamstrings flexible and gluteal-strengthening exercises also support a healthy back. So what is the patient’s time investment? It’s reasonable to expect good progress after three months of physical therapy. The patient should experience less pain and have improved function with an improved quality of life. More work will be ahead of them, but they can see the light at the end of the tunnel. The key is to invest the time and follow a good rehabilitation plan. This won’t guarantee that you won’t have to make a trip to the operating table, but it certainly will improve the odds.